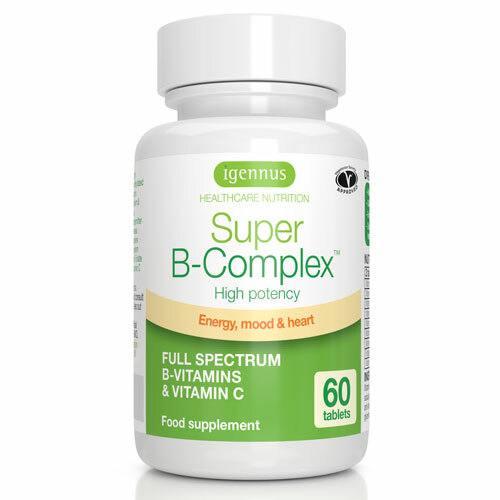 Super B-Complex is a synergistic blend of 8 highly bioavailable B-vitamins with vitamin C to provide comprehensive energy support. A high strength blend of eight essential B-vitamins in their most active forms, with vitamin C designed to support the nervous system and mental performance, contribute to normal energy metabolism, aid psychological and neurological function and help reduce tiredness and fatigue. Vitamin B complex tablets play an important role in many other functions within the body, including the maintenance of normal red blood cells and normal blood cell formation, hormonal function and normal collagen synthesis. Vitamin C; bulking agent: calcium carbonate; gelling agent: hydroxypropyl methylcellulose; vitamin B3; vitamin B5; vitamin B6; vitamin B1; vitamin B2; anti-caking agents (stearic acid, silicon dioxide, magnesium stearate, glycerine); vitamin B12; folate (Quatrefolic); vitamin B7. Adults should take 1 Super B-Complex tablet twice daily. Children aged 7-16 years should take 1 tablet daily. For optimal results take with food. Do not exceed the recommended dose unless advised by a healthcare practitioner. Seek professional advice before taking any food supplements if you are taking medication or breastfeeding. 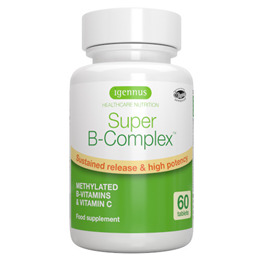 Below are reviews of Igennus Super B-Complex Folate - 60 Tablets by bodykind customers. If you have tried this product we'd love to hear what you think so please leave a review. I take this as have an underactive thyroid and B complex with folate is an important supplement. However, I wish it didn’t have Vit C added. Good product. Very necessary that we get our B vitamins right. Excellent service. Excellent product. Will definitely re-order. Great product, best formula that I have found. Have taken it for 3 months and have noticed an increase in energy. Very convenient way of taking B Vitamins , Vit C and Folate. In my view this is the very best B complex and is excellent value for money. I have taken this for a while and find it as one of the best I have used. I like Igennus products. Out of all the vitamin b complexes I have tried thus far, this one is my favourite. I struggle with a chronic autoimmune disease (hashimotos) and vitamin b deficiency is certainly an issue for me. I've noticed that since taking this supplement, I have more sustained energy when I need it most, and although I still battle fatigue (I'm thinking that I might need a broad spectrum multivitamin and a magnesium supplement too), I have noticed a shift in mood as well as diminished sugar and carb cravings. Overall I'm pleased with the product and will reorder when I run out!